Vasant Panchami: The Epitome of Pure Knowledge Blesses Us! 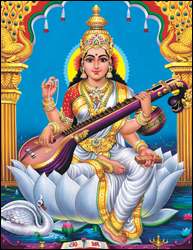 Vasant Panchami is the power day of Goddess Saraswati. It is true that all of us have the unlimited potential and capability to achieve everything or whatever we ever wanted or wish to do respectively. No matter, who we are or what we do, there is always room to be bigger, better and more brilliant – but only with divine guidance! Always remember – We are our only limits and it’s all about breaking those personal limits and outgrowing ourselves to live our best lives. Grab the opportunity by its hand on this Vasanta Panchami. Vasanta Panchami also known as Basant Panchami is one among the most dominant days to attain the blessings of power, creativity, strong will and supremacy. It is the day dedicated to the ruler of knowledge, wisdom and creativity Goddess Saraswati and it falls on the fifth day after Thai Amavasya. Goddess Saraswati, the consort of Lord Brahma, is the personification of knowledge – arts, science and crafts. She represents Shakti, creativity and inspiration. She is an embodiment of grace and an epitome of pure knowledge. Goddess Saraswati is described to have four hands out of which the 2 hands hold and play Veena, one holds aksamala (rosary which signifies concentration, meditation, and contemplation) and the 4th hand has a book ( a symbol of true knowledge ). Her 4 hands represent the 4 aspects of human personality in learning, which are mind, intellect, alertness and ego. Saraswati literally means ‘the flowing one’ and in Rig Veda it is said that she represents a river. Goddess Saraswati is worshipped by both Devas and Asuras, extolled by the Gandharvas and adored by Munis and Rishis. She is the embodiment of universal knowledge. The time for annual examinations is approaching and in all the educational institutions, students irrespective of their levels like high school, first level, second level, Colleges, Universities will be busy preparing for their final exams at this point of time. Even though, your child is bright and an outstanding performer, during exam times they might be engulfed with fear. Some children tend to forget because of the fear in them. However, this is the time when not only the children undergo the stress, but even the parents undergo equal amount of stress. Parents undergo the tension and have a dilemma about the success of child, especially when their children are easy going by nature. To overcome this strain and anxiety, offer prayers to Goddess Saraswati on Vasant Panchami and she will guide you towards success.